The Motorola Moto G (3rd gen) is finally official, putting an end to the endless rumor marathon. We already knew what to expect, but a very important detail eluded us, but it is now set in stone. So fret not, the Motorola Moto G (3rd gen) does have 2GB of RAM, only not all versions of the smartphone. There are two options you can choose from and the 2GB of RAM come coupled with 16GB of storage, while a more modestly equipped 1GB/8GB variant is also available. A microSD slot allows expansion by up to 32GB in either model. A 5-inch 720p display adorns the front of the smartphone, and it’s protected by Gorilla Glass 3. The Snapdragon 410 provides computing power with a 1.4GHz quad-core processor and Adreno 306 GPU inside. You get LTE support, as well as the obligatory Wi-Fi, Bluetooth and GPS. The smartphone boots the latest Android 5.1.1 too, so no surprises here either. The primary camera is a 13MP unit, aided by a dual-LED dual-tone flash. On the front, there’s a 5MP selfie shooter. 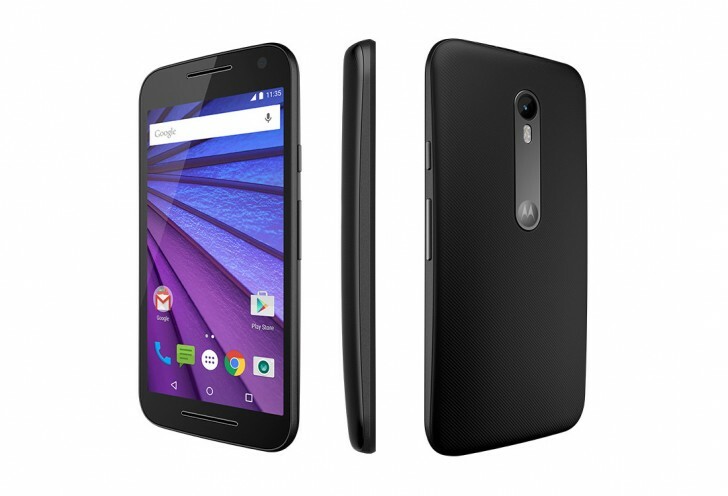 The Motorola Moto G (3rd gen) measures 142.1 x 72.4 x 11.6mm, though the thickness does go down to 6.1mm towards the edges. It weighs 155g, and Motorola have upped battery capacity to 2,470mAh, compared to the 2,070mAh of the predecessor. Perhaps what’s most important in terms of hardware, is the IPx7 certification, which makes the handset capable of surviving after being submerged in up to 1m of water for up to 30 minutes. The Motorola Moto G (3rd gen) is available starting today, though obviously not every retailer has been quick enough to react. So far we have a UK price of £160 for the 1GB/8GB version, and in India the lower-specced model retails for INR 11,999 (~$187), while the 16GB version is INR 12,999 (~$203).